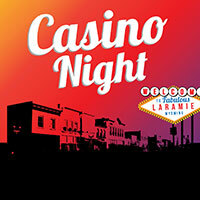 A casino night for University of Wyoming students will kick off weekend activities for the fall semester. The event, sponsored by 7220 Entertainment in the UW Campus Activities Center (CAC), in partnership with Fraternity and Sorority Life, will be Saturday, Aug. 27, at 9 p.m. in the Wyoming Union. In the Wyoming Union’s upper level, students will have the opportunity to play casino games such as slot machines, poker and blackjack; and other games such as bingo and trivia also will be offered. Students will be eligible to win prizes. In the lower level, students can enjoy performances from on-campus student organizations, participate in karaoke or play games in Pete’s Game Room. A coffee and dessert bar also will be available. 7220 Entertainment is looking for committee members to join one or more of its five committees responsible for planning student events during the academic year. A general interest meeting to learn more about 7220 Entertainment is scheduled at 5 p.m. in Pete’s Game Room Thursday, Sept. 1. For more information about the committees and a listing of meeting times, visit www.uwyo.edu/union/cac/7220-entertainment/how-to-join.html. The Late Night Events Committee is responsible for producing casino night and meets Thursdays at 4 p.m. in Room 012 of the Wyoming Union.